Use your Reload or Refresh button to be sure you have the most recent update . Yellow color indicates NEW or changed materials on this page. If you see any UNDERLINED word, click on it to see the link. Use the BACK button at the top left of your monitor to return to this page. The test will likely consist of several columns of matching items. One or several essay item(s) worth at least 10 points. A few multiple choice questions may be included. Study chapter 3 in Betty Edwards, Drawing on the Right Side of the Brain (New Drawing on the Right Side of the Brain) - It is on reserve in Good Library. Chapter 3 explains the research dealing with split brain theory. Study Chapters 1, 2, and 3 in text. Master any terms or concepts you find to be new to you. Review the lists of terms at end of chapters. Be sure to pay attention of new vocabulary used in text. See lists at end of chapters. Review the Whiteboard Notes from 9-23-2002 . Handout: Duncam's "Teaching Art Well"
For an example test answer see this link for an essay answer. When reviewing content and ideas, many find it most helpful to discuss questions and answers with several other students in the class. According to Judith Harris in the The Nurture Assumption, 1998, children are programmed to learn more from peers than they do from parents and teachers. If it works for children, it may work for older students too. Forming a study group or finding a study partner can be a very effective way to do some of your review. Ask each person in the group to come with questions they think will be on the test. Use your private study time to read and prepare yourself for these sessions and to review in response to any weaknesses revealed during study sessions. For How to Earn Better Test Grades see this link. What is Covered in Test I? Click on Underlined blue and purple links to review items. Things taught/learned in the Thursday/Friday sessions working with materials. See Composition . See the Conversation Game at to review a method of generating ideas for an art project. See your " Self Assessment Rubric " for ideas on assessment in art. What criteria could be used to grade the studio work we do? What ideas could students self-evaluate and what could the teacher evaluate? See your " Critique Forms " handout sheets (both front and back side - page 1 and 2) and the Teacher Insrtuctions for Critique that relate to the discussions about your Photo Montage. Surreal Clay Animals made by passing clay. What are synthetic and analytical modeling? Why is changing habits of work importnat? What are the reasons student creativity is greater with some assignments than with others? What are four or more artistic styles that would include nearly every work of art? 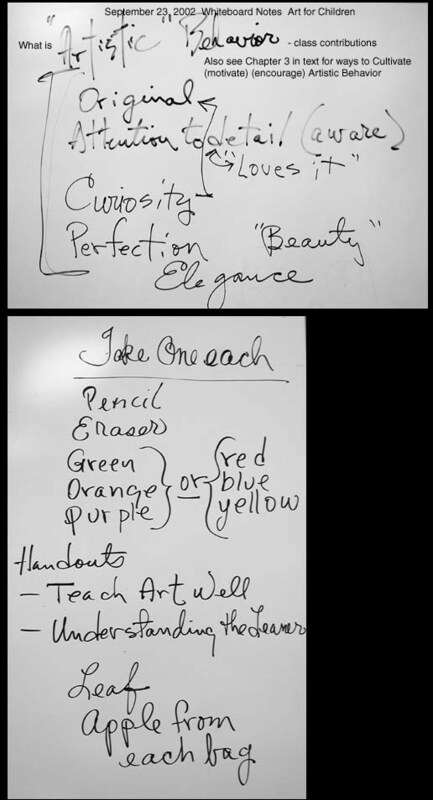 The above link is lengthy, but the section on "Teaching the Lesson" does summarize many of the "best practices" used when teaching art. Study your notes from things presented in the classes on Thursday/Friday, 2 pm sessions. Study your notes from Monday evening sessions. What are the three sources for essentially all subject matter for art? What is learned by blind contour drawing. What are some drawing and/or observation aides and technigques that can help make observation drawing easier to learn? What art elements have been used in each of the rituals? What other art terminology has been learned during the rituals. Note the elements, principles, and vocabulary used to desribe aspects (i.e. methods of shading) of the ritual drawings. What senory input has been used other than vision? Why? Videos shown here have included portions of "Drawing Lessons" where Marvin Bartel is working with a three year old girl. What are some methods of motivation used? After making a photo montage, we viewed webquest results shown us be several students. What was learned from this? "The Little Boy" drew red flowers and green stems and made a deep dish from clay. What are the important improvements that are needed in the case of both the first and the second teacher's approaches and lessons in order the bring them up to the standards described in Planning Art Lessons ? When thnking about this, keep flowers and clay dishes as the topics used, but be able to teach the two lessons so that the child learns what should be learned in art lessons. Study handouts including Duncum article on reserve: "What Elementary Generalist Teachers Need to Know to Teach Art Well" Art Education. Nov. 99. pp 33-37 and the response, " Drawing is Basic" by Jean Morman Unsworth. Become familiar with all of the strategies described by Duncum. Some of the strategies are natural and beneficial. Other strategies are also natural, but not considered beneficial by many art educators. Which strategies does Unsworth consider bad, and why does she think they are bad? See Blackboard "documents" for Bartel's comparison and analysis the the Duncum article and Unsworth response. If we define Art as a symbolic visual language, what does Carroll's three part conception of art add to this? What does she mean by a repertoire of ideas about materials? What are examples of how certain art materials and processes are particularly well suited to say and express particular kinds of things? What design ideas are easier to learn with clay and which with drawing or montage? In what ways might making a drawing be more appropriate and effective than making a photograph? Or, the other way around? What materials would be most appropriate to teach the children observational skills? In our story about the Little Boy who learned to draw red flowers with green stems, does the first teacher think art is a product or a process? In the short story, "The Little Boy," by Helen Buckley, what artistic behaviors does neither teacher encourage? What are the implied messages of the first teacher? What kind of society would need teachers like the first teacher? What would the second teacher need to do to actually be an art teacher instead of a clerk? There may be some preliminary learning in an art lesson that employs some step-by-step instruction in order to focus the hands-on learning about processes and concepts. How does step-by-step instruction used to introduce a process differ from step-by-step instruction used to insure a certain design or finished art product? What are the differences between a product centered art teaching approach and process centered art teaching approach? What needs to happen if process learning is to take place? Why does the second teacher fail to do to achieve process learning and creativity in the work of the child in this story of red flower and green stem? How does a teacher change a student's habits of work (thinking) without being product centered? Just as an artist never creates the perfect and final work because there is always another way to try that might be more effective, teaching is an art that has no final truths that work in every situation with every student. How can creative art processes be taught? How does one teach the thought process needed to come up with your own solution to a visual problem (assignment)? What do you do? What do you not do? What do you limit? Is creativity more likely to respond to limits than to no limits? What do you give? What do you require? How do you help? What kind of help do you withhold? Why and how do you change habits of work? How can we help students to learn to think of ideas they can use in thier art? Why might an art teacher ask questions while children are working on their artwork? Would the teacher always want the questions answered verbally? What kind of questions does the teacher want answered in the artwork? What is the motivational difference between asking a question and giving a suggestion? What did Viktor Lowenfeld mean when he said, "We need to make the child's passive knowledge active."? Can motivation for art work involve more than visual sensory perception and verbal instruction? In what ways have senses other than seeing and hearing been used thus far for motivation for art experiences in our class? If the teacher wants to avoid having the students copy aspects of the historical, contemporary or cross-cultural artwork, when in an art lesson can a teacher introduce examples from art history, contemporary art, or art of another culture? What are the definitions and examples for Art Form, Media, Visual Elements, Principles of Design, Subject Matter, Style, and Topics? What are some examples of contrast other than tone or value when it comes to visual concepts that can be used as the basis for art lessons? In the text on pages 94 - 99 is a discussion of what we have called a "crisis of confidence". How does text suggest this be avoided? Explain the effect of good observational drawing instruction "on the right side of the brain" on the likelyhood of developing a crisis of confidence? When making clay sculpture of animals or people, Viktor Lowenfeld said children can learn to work either of two ways. What are they? Which way is most likely to be the untutored way for a first grade child? Which way would insure some "changing habits of work" and help them learn new ways to approach the form? Why did Viktor Lowenfeld pass out hard candy to children before they drew pictures? What was he attempting to learn? Why do we often use food for the art subject, and we never use food as the art medium? Why do some art teachers who have children draw, paint, and model from actual animals never ask them to draw, paint, and model from photographs of animals. What are some methods and processes used in our class thus far that can be used for idea generation and refinement (before beginning on the final project in an art assignment)? What design principles can be applied to the creation of a montage while working in Photoshop? As seen in the handout, Critique Form what kind of issues can easily be discussed without being negative when reviewing each other's art work? What is DBAE? What are the four disciplines of Discipline Based Art Education? Can you explain what they are and how they are taught? What are some teacher methods that can be used to foster a richer and more fluent ("fluent", means the ability to think of many possibilities rapidly) memory and imagination before and during an art project? What are things done during a non-drawing field trip to make sure students' perceptual intake is activated to its fullest. What can teachers and parents do to insure that they pay attention, more is noticed, and more information is collected. What are methods used in our class to help students see what they may otherwise overlook when they are making an observational drawing? What verbal and non-verbal methods are used? Problem solving ability is important because there are many problems and injustices in society. Children who grow up with the ability to use problem solving skills can help make the world better for themselves and others. However, people don't solve problems unless they see them as problems. How can teachers use something like an art assignment or project to teach problem recognition and definition ? Can you give an example? What are the connections between "changing habits of work", "limiting options in an assignment", and "student creativity"? If the teacher does not show the example first, how are the students supposed to know what to do?